Thanks to everyone who voted in the polls. I’ve also collated some views from the ‘analogue’ world – studio users and muso mates etc (plus a few Facebook comments) – and the verdicts are as follows. Sofa – second-hand leather. It will age gracefully and be, er, wipe-clean. Many a studio sofa smells of old ganja and stale sweat after a year or two. Or maybe I’m too used to working with students. 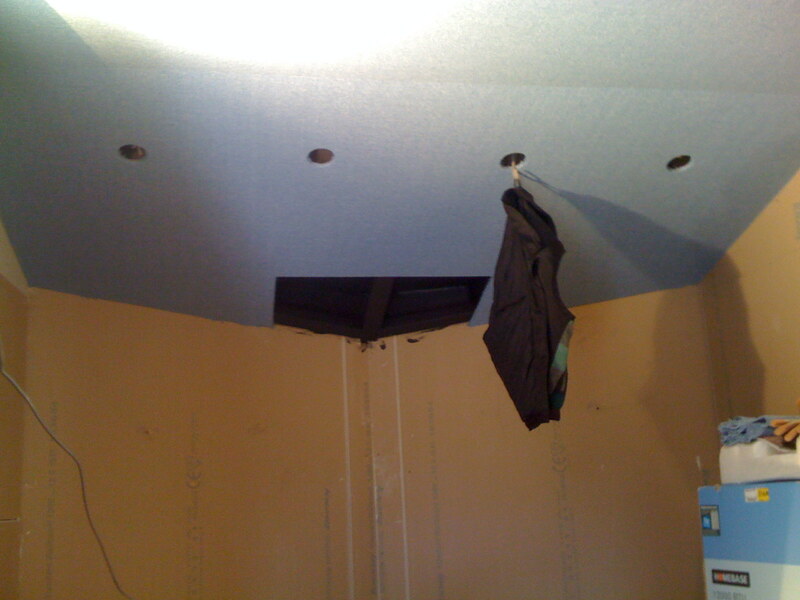 This is the Mac hidey-hole, which will be sound-insulated and allow Mac fan heat to escape into the void. The newest addition to the structure is a hole for a soon-to-constructed Mac box, made to measure, which will serve two functions – extracting hot air from the Mac into the void behind the baffle, and isolating the control room from the Mac’s fan noise (the Mac Pro fans are pretty quiet anyway, but it will be great to have the option of perfect silence in the control room for vocal/guitar takes etc). 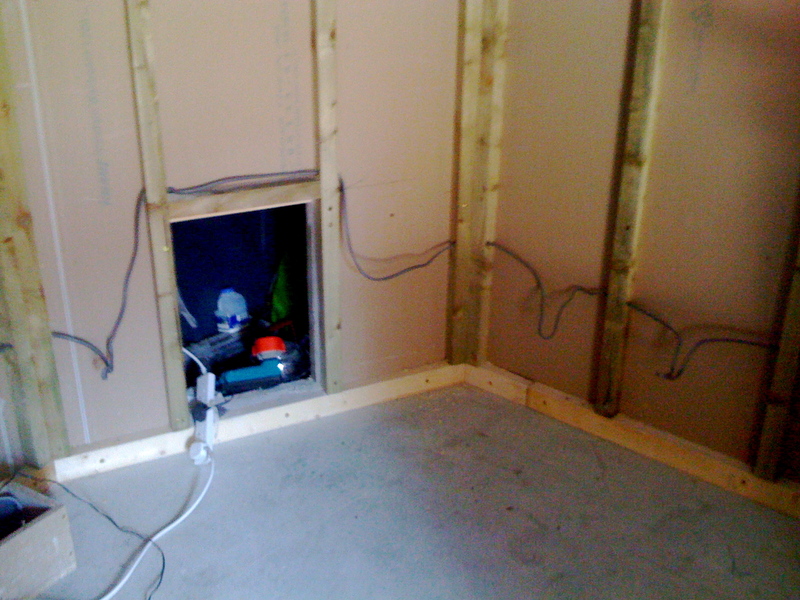 The guys are going to build a mini-door at the front of the Mac box ‘cupboard door’ so visiting musos can plug hard drives straight into the Firewire socket on the front of the Mac. So now that we’ve got a custom-designed computer area built into the architecture, I’m hoping Apple don’t change the design of the Mac Pro any time soon! 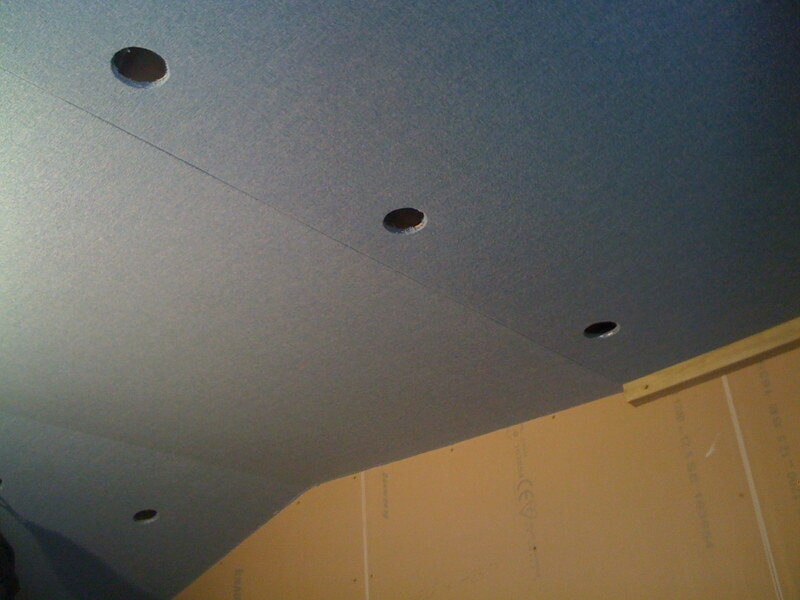 Control room monitor area, showing light sockets and aircon inlet; the whole ceiling is now covered with blue hessian frames. Ceiling with light sockets. There are three different angles above – they are (roughly) 15°, 3° and 1°. 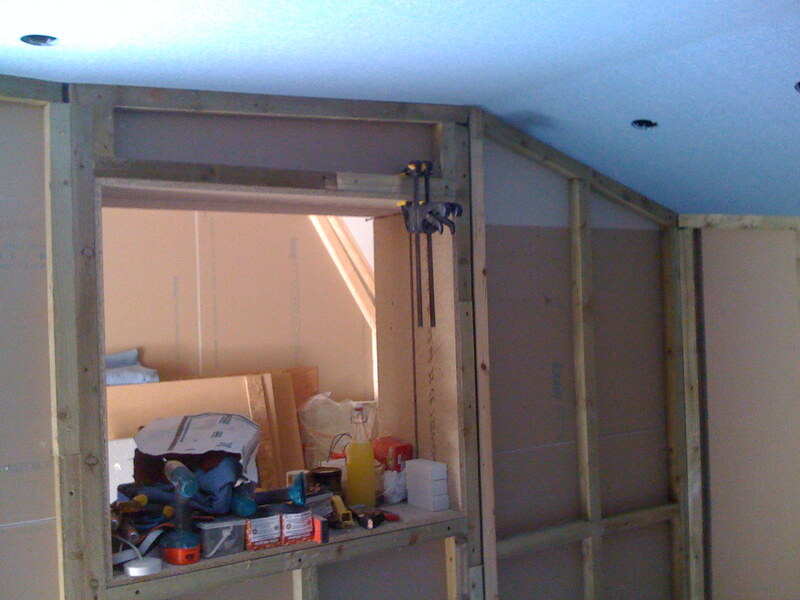 The wooden wall shown here will be filled with rockwool and covered in light green. Ceiling above control room window.